Tuesday the 30th December saw the first day of the ISAF Tornado World Championships and Global Mixed Championships in Perth, Western Australia. 30 teams from 7 nations have made the trip to Nedlands Yacht Club to enjoy the sunshine and fantastic sailing conditions that Perth has to offer. 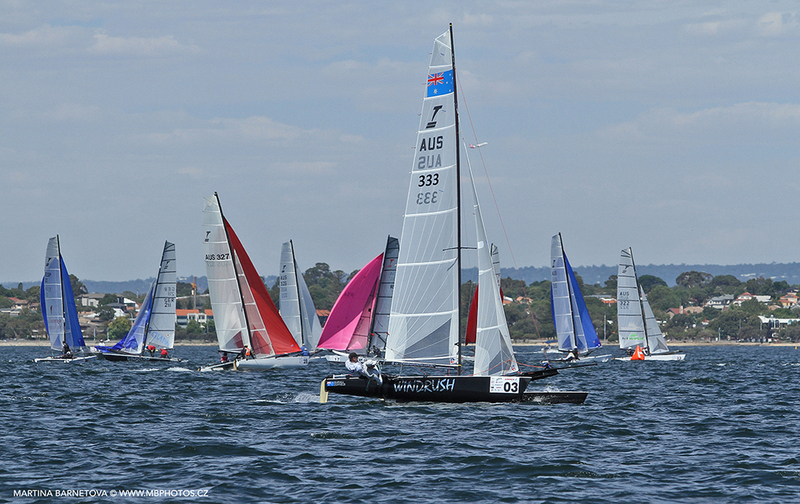 Since the 26th December the majority of boats have also been warming up, sailing in the Australian Championships. Team Redbull sailing their boat Glory & Drama won that event. 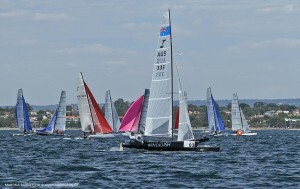 8 races were sailed over the two days in action packed conditions. The first day of Tornado World Championships started with a practice race for the 7 boats who chose to take part. The warm Easterly breeze which kept building throughout the race put the sailors through their paces and provided some of the best sailing of the day. As expected the Easterly breeze died out and the wind shifted to the West with the sea breeze coming in. The afternoon was very warm with temperatures of 41 degrees providing unstable winds from the South West between 8 and 14 knots. 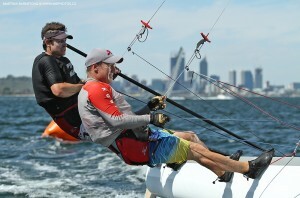 The first race was won by Gavin Colby and Pete Dubbelaar (Australia) who led from the top mark. They managed to hold off many others in a close race to the finish with Team Redbull (Greece). The second race of the day was a reverse of places with Iordanis Pachalidis and Konstantine Trigonis (Team Red Bull) taking the victory followed by Gavin and Pete. This leaves both teams on equal points but with the Greeks leading on countback going into day two. In 3rd place from Australia are James Clark and Ben Taylor on the same points as local hero’s Brett Burvill and Ryan Duffield. Tonight the class held their Annual General Meeting in the clubhouse of the Nedlands Yacht Club. Tomorrow three races are scheduled, one in the morning and two in the afternoon.